Abstract: Made from a heavy gauge steel case, the DSH-5 has five (RJ-45) auto-negotiation 10/100 MBps Ethernet ports and one switching uplink connection. At one point or another just about everyone needs a hub. Whether it's required for an expansion on a small office network, or as the back bone of a SOHO network, how do you know which hub is right for you? Port Size is generally the measuring stick by which we gauge a hub, and a 5-port hub like the Dlink DSH-5 is the subject of this review. 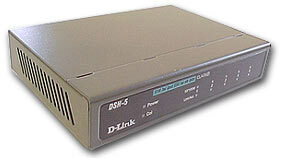 Made from a heavy gauge steel case, the DSH-5 has five (RJ-45) auto-negotiation 10/100 MBps Ethernet ports and one switching uplink connection. As with just about any hub on the market the manufacturer cleverly insists you should upgrade your network by stacking hubs atop one another. I always suggest getting the largest largest hub you think you'll need right off the bat, and save yourself some money later on. Anyway, for those of you who want multiple 5-port hubs, the DSH-5 comes with little rubber feet which alow it to stack easily. Screw holes on the base mean it can be attached to a wall if necessary. The small size of the DSH-5 is plus many may overlook. Some manufacturers make a range of stackable hubs which are much larger than they really need to be, so it's nice to see something paired down to the absolute minimum and constructed in such a way that it won't shatter the first time it's pulled off a table. The front of the Hub has indicating LED's for each connection (link established/packet activity and 100MBps connection confirmation), an indicator for collisions and one for power - all fairly standard to most hubs. The rear of the hub has the five RJ-45 Ethernet ports, one uplink port and the DC power connector. As you know, when connecting hubs together, they should be joined together by the uplink port using a CAT-5 crossover cable. For more info on the types of CAT-5 cable read our "Cutting your own CAT-5" article. In addition to explaining the differences between 568A and 568B cable conventions, it guides you through cutting and testing your own custom Ethernet cables. The metal construction of hub is a nice feature, especially when we think of the plastic hubs we've trashed in the past. Now, that's not to say we intentionally went out and destroyed them. Rather they sat on a desk and as someone walked by they snagged a loose Cat-5 cable, bringing the hub to the floor. Hubs really fall under that install and forget category, and that is where they should sit. Bad hubs can corrupt your data. Good hubs just sit there and become a transparent apparatus to your network. That is thankfully where the DSH-5 fits in. We tend to do a lot of file transfers on our network (backing up and reinstalling windows most of the time) and this hub has so far been working pretty diligently. On an older no name hub we were using, file transfers of the gig or higher variety would always light up the collision indicator like a Christmas tree. The DSH-5 fairs markedly better in this regard, though with that amount of data flowing through the network collisions still remain. As always the sign of a good hub is not knowing it's there, and for about $80CDN, the DSH-5 thankfully complies to that mantra.